Rated: 6.5 out of 10 with 89,407 votes. 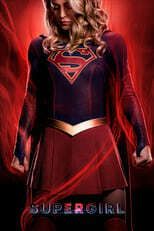 In season four, Supergirl is facing a bigger threat than sheâs ever faced before â a new wave of anti-alien sentiment, spreading across National City thatâs fomented by Agent Liberty. As Kara mentors a new reporter at CatCo, Nia Nal, and tries to use the power of the press to shine a light on the issues threatening to tear the city apart, Supergirl takes to the skies to battle the many villains who rise up in this era of divisiveness.